Investigation: The school security industry is a booming business — but will it make students safer? In an underground meeting room attached to the U.S. Capitol, security company executives and government officials discussed the dire need to “harden” America’s schools before another student is killed. It’s a conversation that’s played out across the country following recent mass school shootings in Florida and Texas: By buying sophisticated security equipment, educators can prevent violence, or at least mitigate bloodshed, on their campuses. 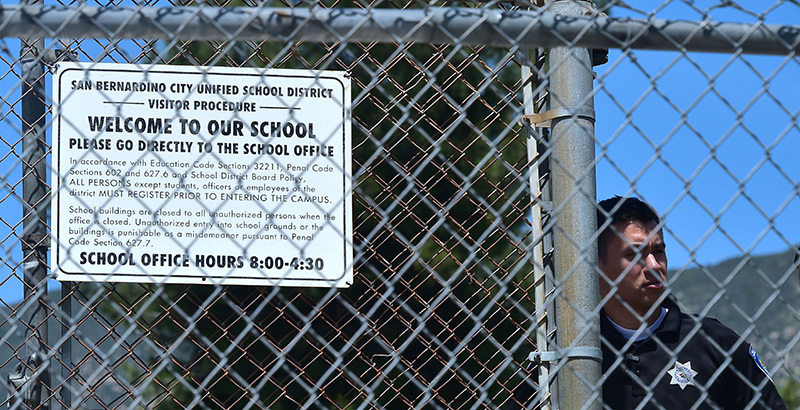 Amid an environment of heightened fear among school leaders and parents, critics argue that these security companies have an ulterior motive: profit. And although most schools have security equipment, like surveillance cameras, research into the effectiveness of this technology is surprisingly scarce. So are America’s students any safer? Read the full investigation. School Design: Architecture meets academics — After hearing from teachers that sensory challenges such as buzzing lights and clanging air ducts were overloading students with autism and other disabilities, a Minnesota district that serves children with specific and intense needs built three schools designed to soothe. District leaders expected happier kids and calmer teachers, but they were surprised how quickly the focus in these carefully thought-out classrooms turned to academics. Teachers had to sprint to plan lessons when it became clear that students, no longer overwhelmed, were ready to learn. 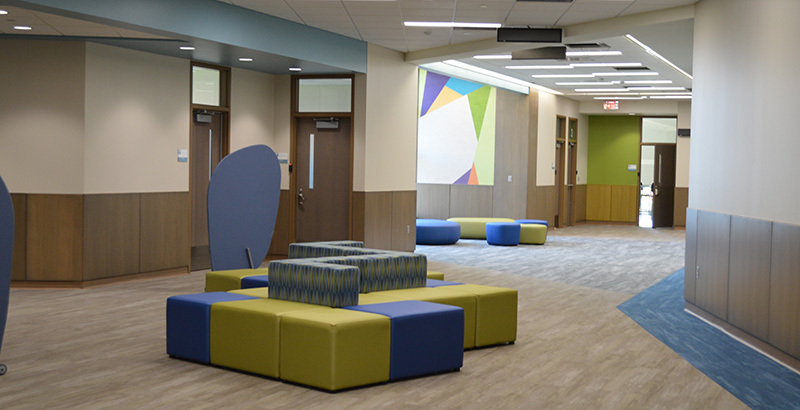 Beth Hawkins takes a look at the design process behind the new schools and the model they are providing for districts around the country. Read the full story. But are the classrooms of 2018 and beyond rising to meet this seismic shift? 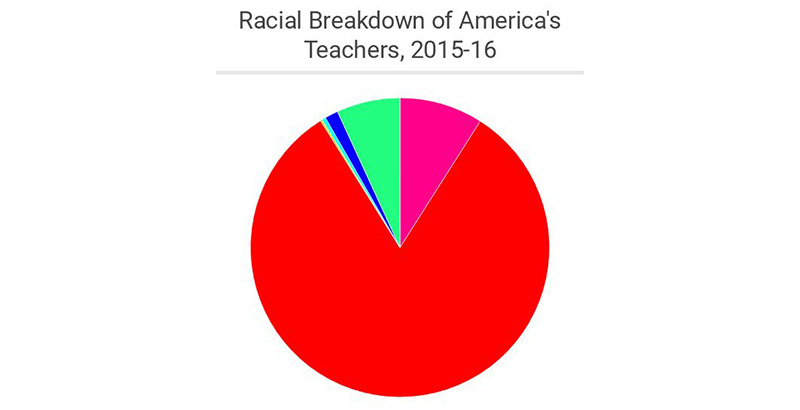 Although America is becoming more diverse each year and is expected to have a majority-minority population by 2044, the teaching force is not keeping up with the changing racial makeup of America’s children. Elementary and secondary school teachers form a group far whiter and more female than the students in their classrooms, despite a strong body of research that indicates that a diverse teaching staff benefits students of all races. 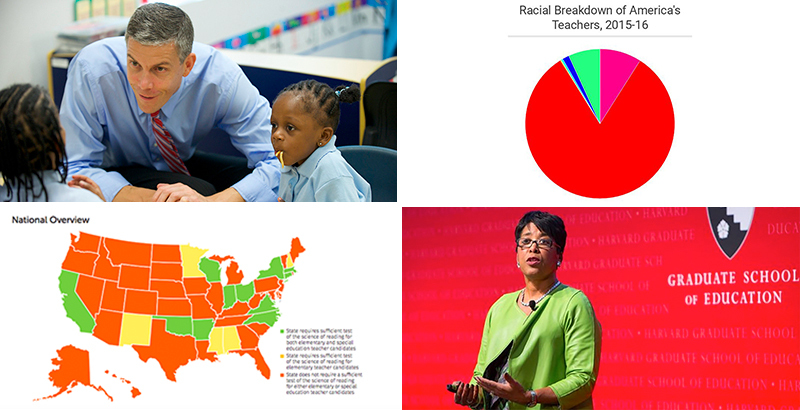 The 74’s Laura Fay talked to experts about how to raise achievement for all students and recruit more teachers of color — but observers agree American education is not making progress fast enough to meet the various academic, social, and cultural needs of the increasingly diverse students it is charged with serving. Here’s a closer look at the racial diversity of America’s schools — both learners and instructors. Read the full article. 74 Interview: How ESSA aims to boost family engagement in schools — The Every Student Succeeds Act created a subtle but important change when the new federal education law was passed a few years ago. It replaced the phrase “parent involvement” with “family engagement.” The idea behind the shift was to engage the whole family in a child’s education, making them true partners with schools in a student’s learning. 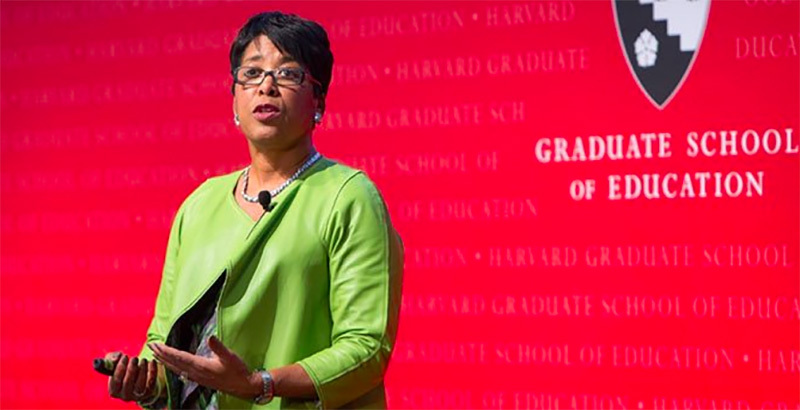 That’s according to Karen Mapp, a senior lecturer at the Harvard Graduate School of Education, who worked as a consultant with the U.S. Department of Education in 2013 to help rethink the place of family engagement in schools. But that wasn’t the only change made to the federal education law. Here’s how Mapp says ESSA is encouraging states to make families more central to the role of teaching and learning. Read the full interview. Big Picture: States aren’t doing nearly enough to ensure that new teachers understand how kids learn to read, according to a new report from the National Council on Teacher Quality. 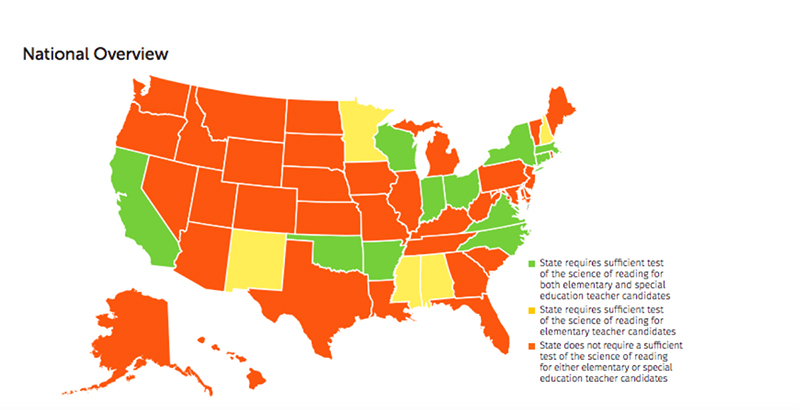 Just 11 states mandate that elementary and special education teaching candidates be tested on what is called the “science of reading” — the broad body of research on child literacy development — in order to gain a license. Unless teachers demonstrate some awareness of that research, the report says, we can’t be sure they understand scientifically based methods of literacy instruction. Read the full article. Book Preview: In nearly seven years as U.S. secretary of education, Arne Duncan pushed the very limits of a child-centric approach to education politics. “I didn’t think my guiding principle — when it comes to education, we need to put kids first — was that radical,” he writes in his new memoir, How Schools Work, “but I’ve found that it actually is.” In the book, Duncan recalls a spate of notable — albeit controversial — initiatives implemented during his tenure as secretary, from overhauling teacher evaluations to expanding the Common Core State Standards. He also touches on navigating “divisive” politics, offending white suburban moms, the enemies he’s made, and his enduring friendship with former president Barack Obama. Taylor Swaak offers seven key highlights. Good News: When 18-year-old Alex Kitson moved with his family from England to Arkansas two years ago, he had a bit of adjusting to do. The town of Bentonville is much smaller than his hometown of Sheffield, and the locals’ idea of what “football” should be is much different from his. Where he immediately found his footing, though, was in Bentonville High School’s rigorous academics. The teen whiz excelled in his Advanced Placement classes — and just found out that he aced all eight challenging exams he took last May. Perfect 5s, across the board. Now, he’s off to his dream college, the London School of Economics. Read the full story. ESSA: Six things we know about ESSA’s ‘fifth indicator’ — Many educators and experts thought the Every Student Succeeds Act (ESSA) would offer states an opportunity to track student gains based on factors other than academic achievement. Of the five required indicators states outlined in their education plans to help identify their lowest-performing schools, the fifth indicator was the only true blank state, enabling states to choose a non-academic measure like school climate and safety. But Taylor Swaak’s deep dive into 50 ESSA plans found that the chosen fifth indicators are still largely academic — and are jammed with up to 11 different measures per state. Read more about six key trends and highlights. EDlection: You’ve likely already heard about Jahana Hayes, the former National Teacher of the Year running for a House seat from western Connecticut. (She won her primary earlier this month.) And maybe you know that she’s a little different from the hundreds of her fellow educators also charging Capitol Hill this fall. Sure, she’s raised gobs of cash and won endorsements that other pols would kill for, but that’s not the important part: Hayes also grew up poor in hardscrabble Waterbury, became a mother at 17, and fought for nearly a decade to earn a place in her profession. Now she looks like her hometown’s next congressional representative — and maybe the future of the Democratic Party. Read Kevin Mahnken’s full profile (and follow our other top education-related races of 2018 at The74Million.org/Election). Absenteeism: The U.S. is facing a chronic absenteeism crisis, according to the U.S. Department of Education, with about 16 percent of the nation’s K-12 students — nearly 8 million kids — reportedly missing 15 or more days of school during the 2015-16 school year. In response, 36 states and Washington, D.C., are tackling chronic absenteeism under the Every Student Succeeds Act, the federal law requiring states to identify and assist their lowest-performing K-12 schools. But with ESSA’s vagueness and a slew of competing state priorities, will these provisions make a difference? As Taylor Swaak reports, some experts are expressing concerns about the lack of clarity or focus when it comes to the wording of states’ plans for complying with ESSA mandates. Also at issue: Nearly half the state plans incorporating absenteeism are dividing their nonacademic indicators among more than four different focus areas. Could this splinter a state’s focus? Read the full analysis. 4Fams: Typically when there’s a school shooting, privacy laws prevent the public from reading a complete account of a student suspect’s history. But a Florida reporter discovered that Broward County Public Schools inadvertently failed to black out portions of a report on the district’s handling of suspected Parkland shooter Nikolas Cruz. It revealed a series of actions by school staff that effectively blocked Cruz from re-entering a special education program where he had made great strides. While Cruz’s long history of violent behavior leaves open the question of whether the mass shooting at Marjory Stoneman Douglas High School could have been averted, the tug-of-war over what to do with him will be wrenchingly familiar to millions of families of children with disabilities. Beth Hawkins describes how swiftly — and sometimes unexpectedly — advocacy for special-needs students can be derailed by erroneous information or conflict with school staffers whose job, supposedly, is to help. Read the full essay (and see more of our coverage for families at The74Million.org/4Fams). Go Deeper: Get the latest news, analysis and exclusives delivered straight to your inbox — sign up for The 74 Newsletter.